MOSCOW, February 15 (Itar-Tass) — Russian security services captured the archives of a warlord Ibragim Khalil Daudov, who was killed in Dagestan. 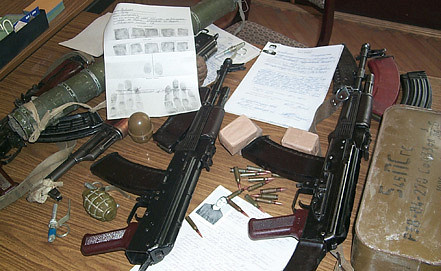 “The security services found the archives of a warlord Ibragim Daudov, who was destroyed in an anti-terrorist operation in Dagestan, including his video address with the appeals to kill innocent people, elderly people, women and children,” a source in the information centre of the Russian National Anti-Terrorist Committee told Itar-Tass on Wednesday. The bandit did not conceal his cruel intentions, when he said that he will show mercy to no one “should you be my sister or her child.” Daudov urged young people “to leave their wives and children... and unleash the jihad.” “He wants these young people to be killers, suicide bombers and bandits, hoping to turn Dagestani young people in the food for powder of the gangs,” the source said. “Suicide bombers Khoroshev and Razdobudko can serve as a good example, as the latter left their little children and committed suicide bomb attacks,” the source said. “The destruction of the warlord is a logic end of his criminal activities. The law enforcement agencies will take the most decisive measures to eradicate the gangs and ensure the safe life of Dagestani residents,” the source underlined.